Come experience the wonder and whimsy of Willy Wonka’s fantastic factory in an all new slots experience! Where the wins get sweeter as you level up! 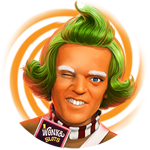 Join Charlie now and the gang in Willy Wonka Slots. Mobile for Android and iOS. Play on Facebook! Share Willy Wonka Slots Free Credits.